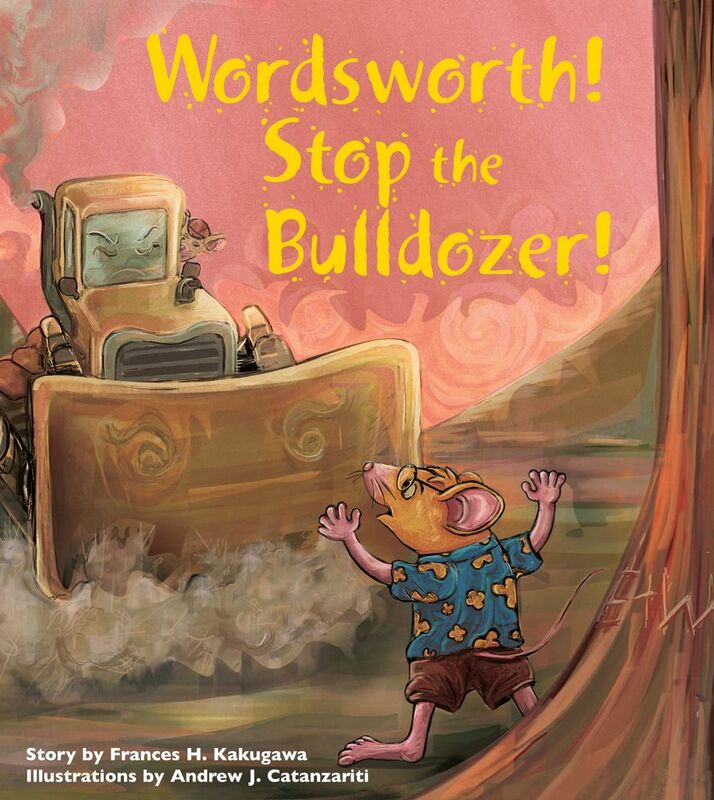 One of my favorite keiki book series returns with its third installment, Wordsworth! Stop the Bulldozer! (Watermark, 2012). The book begins with an opening request from author Frances H. Kakugawa to join the Wordsworth Plant A Tree Society. The gist of it is to plant a tree, have your picture taken doing so, and you’ll receive a Wordsworth certificate along with your photo being featured on her Facebook page. No surprise, I am very eager to join the society and get a certificate; I just need to figure out how to plant a tree! For more info on the Plant a Tree Society and a view of the certificate, visit Frances Kakugawa’s Blog. In Wordsworth! Stop the Bulldozer!, Wordsworth misses his long-time friend Emily, who recently moved to Maine. Along with his buddies Dylan and Eliot, Wordsworth befriends Akiko, a new student from Japan who sits in Emily’s old seat at school and helps to teach them Japanese poetry. While exploring, the group learn about different wood grains and trees from Wordsworth. In one of my favorite exchanges, one of his friends asks, “Wordsworth, how do you know all this stuff?” To which Wordsworth replies, “Oh, I read it in a book.” Meanwhile, distracted by the melancholy of Emily’s departure, Wordsworth finds his special koa grove decimated by a bulldozer, leaving just one tree left. Through forms of protest, both physical and written, Wordsworth, Akiko and their friends find ways to raise awareness about the importance of saving the trees in our community. Like previous books in the series, this one is full of poems written by Wordsworth, including a couple by Akiko and their friends. Akiko’s inclusion to the series introduces readers to the ancient Japanese style of tanka poems, which are explained in the introduction as 5-line poems with 31 syllables following a 5-7-5-7-7 format. Aside from learning various forms of Japanese poetry, Wordsworth also continues to teach children the importance of friendship (Wordsworth keeps in touch by writing to his long-distance friend Emily and makes an effort to befriend new student Akiko), reading books (see my favorite exchange in the previous paragraph), the impact of trees on a community’s history and the environment, and of course the power of writing. I always love that this series promotes poetry as a means of not only expressing your personal thoughts and emotions, but that the power of words have the potency not only to describe, but to inspire action. What would happen, if all the poets in the world wrote poems to save our forests, rivers, animals, earth, air and oceans? Wouldn’t that be something? Whether intentional or not, another aspect of the Wordsworth series that I’ve grown to enjoy is how it’s become a vehicle for featuring different local illustrators. Wordsworth the Poet began with Scott Goto, who helped define the lasting look and feel of the Wordsworth series. Wordsworth Dances the Waltz presented the stylistic brush of Melissa DeSica, whose Watermark book Gecko and Mosquito is another favorite of mine. And now Wordsworth! Stop the Bulldozer! is illustrated by Andrew J. Catanzariti, who recently did a fantastic job on the cover art of Don’t Look Back: Hawaiian Myths Made New. Catanzariti continues to honor the classic design of the Wordsworth books while flavoring the illustrations with his own colorful sketching style. One of my favorite sections is towards the end, when each of Wordsworth’s friends writes a poem to save a tree. It brings together varying types of trees and poetry, each punctuated by dynamic portraits of the tree and its mouse savior. Overall, this is another excellent entry in the Wordsworth the Poet series. Kakugawa’s writing finds ways to encourage children to get involved with issues such as the environment, get interested in different styles of writing such as Japanese poetry, and promote healthy and fulfilling relationships with their peers. Maybe I am biased because I am a big fan, but I highly recommend this book and any in the series as essential keiki reads. Recommended for ages 5 and up. For Frances H. Kakugawa events in Hawaii, including readings and book signings for the Wordsworth the Poet series, check out our HBB Events Calendar.